Honestly, I never thought today would come. Not the date, that’s a given. Not Wednesday, that’s just…Monday III. No, when I say that I never expected today to come, I mean this post. Right now. Right here. Me, celebrating the second anniversary of the date that I pressed “publish” on my first ever post. Last year, on my first blogiversary, I talked about how much I deliberated before I started my blog. And I discussed how utterly amazed I was when people started to come, to read, and to cook. And over the last 12 months, my amazement has grown, just like the blog. It’s amazing how many of you come visit my tiny little corner of the internet. I’m awed and flattered to be a part of so many of your kitchens. It’s been a crazy year. Crazy good, really. Some folks have taken notice of my little blog. I’ve met some amazing friends, both fellow bloggers and readers. I’ve started to work as a freelance food and product photographer. I’ve baked a ton of cookies. And of course, keep coming back! In a small bowl, whisk together the flour and cocoa. Set aside. In the bowl of an electric mixer over medium speed, cream together the margarine and sugars until smooth and creamy, a couple of minutes. Add the eggs and vanilla extract, and beat until combined. Turn the mixer to low and slowly add the flour mixture. Beat just until combined. Do not overmix. Remove the dough from the bowl and separate into 3 sections. Place each section in a bag in the fridge and let chill for at least an hour, and up to a day. Preheat oven to 325. Line a cookie sheet with parchment paper and set aside. Roll out the dough between two pieces of parchment paper. (Do not use flour as it will show up against the chocolate.) Roll the dough to about 1/4 of an inch. Don’t roll too thin or the stick will not fit properly in the cookie. Cut shapes of your choice out of the cookie dough. Place cookie on the tray and gently push a stick into the cookie. Bake at 325 for 15 minutes. Remove from oven and set aside to cool completely before decorating. Brush a thin layer of corn syrup over the surface of the cookie. Pour sanding sugar on top. Turn it over and shake gently to remove the excess sugar. Yes, it’s that simple! Playing around: To line it with another color, pipe royal icing (using a #2 piping tip) around the edge and immediately dip into contrasting color. You can also play around with patterns and designs by coating only a part at a time with corn syrup, then decorating other parts of the cookie with a contrasting color sugar. One of the things that I have been enjoying lately, that has also improved my knowledge and skills in the kitchen, is my subscription to a number of food related magazines. So in honor of my blogiversary, and to thank you all for reading, I want to share the fun with 3 of my lucky readers. Three winners will win a 2 year subscription to one of the following magazines that I subscribe to and love – winner’s choice! Entry #1 – Leave a comment on this post telling me how you found the blog, what your favorite recipe is, how long you’ve been reading, or really anything. I want to hear from you! Details: Giveaway is sponsored by me. Eligible to anyone with a US mailing address. Giveaway ends at 11:59 pm on Thursday, August 15th. Winner will be chosen at random and notified via email. Winner has 48 hours to respond or a new winner will be chosen. Must include valid email address to enter. I love your blog. I am one of your earliest fans. I am so impressed by your professional growth and your talent. May you have many more years of successful blogging. I recently discovered your blog on Tisha B’Av when my friend and I were recipe searching online. I fell in love with your salad dressing and the pomegrante chicken salad. I also subscribe to overtime cook through email. I’ve been following you practically since you started. I love seeing what you bake, what ideas you come up with around the chagim, and how you style everything for the photos. I found your website while looking for new supper ideas. I ended up taking a shot and making that night the black bean burger recipe with zucchini fries. Shockingly enough, my husband eat them both and really enjoyed! Ever since I have been following your blog! I sub to your emails!! Still do not do pin! Follow on the Facebook !! This post is amazing, Miriam, and is my new official favorite 🙂 When I first started blogging, I didn’t really follow any other blogs and you were one of the first I followed!!! I’m not sure how I found your blog, but I’m really glad I did! Happy 2nd blogiversary! Found you through the AMI and imamother together. Happy Second Blogiversary!! I love your recipes! Happy Birthday overtime cook!!!!!! These look awesome. Would love to try. Oh and yeah, I LOVE THIS BLOG!!!!!! I was just on the Internet and chanced upon your blog,I use it almost every day…..I share it with everyone and love everything about it:).i subscribed to receive the emails and like you on Facebook. Happy second! I already follow you on Instagram. I am fairly new to your blog (found you by searching for #ninedays recipes) and so I don’t really have a favorite recipe yet, but it must be said- your photography is gorgeous! I backtracked to some older posts, and the really cool part is that you can see your growth through the pics there just as much as (if not more obvious than) your recipes! You go, girl. Happy anniv! love your blog, my fave is pastrami stuffed shells, mock breaded cauliflower, roasted veg chickpea salad! I know I should come back here every time I try something and I love it, and let you know. I don’t always get to it…but I want to say how much I love your blog…and how I use so many of your recipes all the time. Thank you! I have been following your blog for over a year- I think I came across your blog through a kosher blog connection on someone else’s page. I enjoy your creative baking recipes! Happy Blogiversary to you! Only recently discovered your blog but love what I see. I can only hope to be as successful as you when I hit 2. Congrats! And follow you on Pinterest. Happy Blogiversary again! I have done all entries except the Instagram since I don’t have that. I have been reading your blog for a couple weeks now. Needed tampering) to make s’mores fudge. I made a graham cracker crust and put the fudge on that. Topped with marshmallows once set and thrown under the broiler for 2 minutes and it was insanely good! Thanks for being a site full of recipes I can count on to be tried and true. I discovered you on Twitter. Best recipe was Passover chocolate cake. I like the page on Facebook. I subscribe to the blog on email. I found your blog on facebook through an awesome cooking group that you are a part of. I already get your email. I’ve been following for about 1 year. I found you through mutual friends. My family loves the zebra cake! You know how I found you! Follow on Twitter and RT your stuff. I found your blog via facebook and love it. I have tried some of your cookies. Everything comes out great! I read your blog because your my best sis!! and cause I love your recipes! I was sent to your blog from imamother.com and have been addicted ever since! Your recipes and pics are awesome, and your style of writing keeps me hooked! Happy two years! I love those cookies, perfect for the celebration. I cannot recall how I started reading your blog, but I am very glad I do! Thanks for sharing!! Wishing u much success! I have a recipe that I make time and again because people love the item and it is lemon squares that came from a cookbook from the preschool that I went to. It is easy but they taste delicious. I found the blog on facebook when one of my friends shared a post. I tried the caramal bundt and the strawberry & cream bundt. Both were delicious! Never before had I eaten anything as amazing. I found you Googling for something; I don’t remember what! (probably a recipe). I only just found the blog today. I love your blog. Your recipes are awesome. You have enhanced my culinary skills. Thanks Miriam! I first found you on facebook, and then subscribed to your e-mails so that I don’t miss anything. You are an inspiration to those of us that hesitate in the kitchen. I always look forward to what you are up to next! Here from the beginning! So proud of what this blog has turned into! I think I’m one of the first ten fans – or if not at least a very early adopter :)! While I have no idea how I found your blog, I’m really happy that I did!! Happy blogiversary! Love your creativity and wonderful recipes. Thanks for the great giveaway. Im following you on facebook! I like you on facebook. great blog!! I don’t remember when I started reading your blog but I love your posts and all the food looks yum! Some of my favorites that I have made are the marinated grilled chicken, zucchini fries, red velvet cookies, and the smore’s cheesecake. Love your blog! Congrats on 2 years!! i follow you on fb instagram and twitter. love your blog!! So excited to try so many of these awesome recipes! Finally signed up! I just found your blog today great recipes caramel bundt sounds super yummy. Happy blog anniversary!!!!!!! i found u on fb (whats for supper) i love all ur recipes that i tried!but the zebra bundt cake my family loves best!!!!!!! I love your blog and my favorite recipe is the commons buns with the cream cheese frosting. congratulations on a job well done! I am signed up to type email and I read every one! I found your blog by following a very tasty recipe: it was the grilled zucchini. Very yummy! I am following you on twitter and Pinterest. Love your blog and love the Facebook page. Keep up the good work, I am looking forward to many more recipes. I am rookie in the kitchen and you inspire me. Happy 2nd blogiversary, Miriam! You shouldn’t be surprised at all that you have such a loyal, enthusiastic following – your blog rocks and everything you make is amazing. Your cookies look incredible – I love how you shaped and photographed them. Here’s to many more years of blogging! I found your blog via Facebook – for the life of me I can’t remember who “shared” one of your posts, but I’m so glad they did! I love your blog! I’m a newly wed, and so I’m always looking for new ways to wow my new husband in the kitchen and your blog has definitely helped with that. My favorite recipes? I’m partial to all of the cookies myself 🙂 Thanks for your awesome blog! Hi! Love your blog! I follow you on both instagram and pintrest! I’m a WordPress follower. Old school, huh? Am I the only WordPress follower on here? I just discovered your blog. Very nice! My favorite recipe is anything with deep dark chocolate! I found your blog on More Quiche Please. I don’t remember how I found you, but I’ve been a fan for at least a year now and loved the journey! I’m on your Instagram now. Pick me. I love you. You love me. We ” met” on twitter and it was blogger love at first sight. ha ha ha!!!!! Love your blog, thanks for sharing all those delicious recipes! 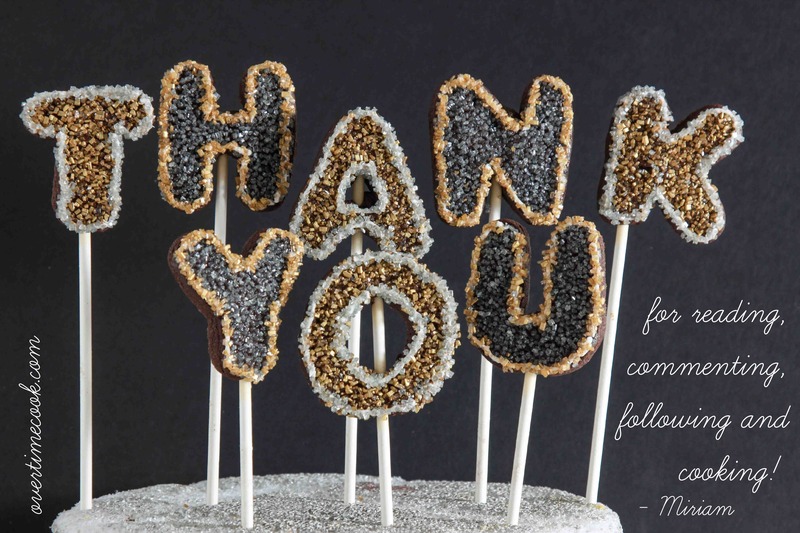 Congratulations miriam on successful 2 yr blogging! You’re a great inspiration to all us home cooks showing us that cooking can -and should be fun and interesting. My favorite recipe is your cream cheese coffee crumb cookies. I just made another batch of them! May you have many many more great blogging years! FOUND the blog? Honey, I was your doula when it was born. Do I need to rehash that to get a magazine now? But who needs magazines when we have blogs? Keep it going! And of course I like you on facebook. I like you wherever you are. I am pretty sure I’m a pinterest follower too. Though I don’t really use pinterest. You ALMOST got me into it. Congratulations on your blogiversary! I wish I could tell you how I originally found your blog, but I don’t remember. It’s been a while, and I’ve switched email addresses I subscribed with, so I can’t even go back and check. I like reading your posts, and have plans to make your Blueberry Cupcakes later this month using those delicious tiny wild blueberries that grow everywhere here in Maine. I follow @OvertimeCook on Twitter (@NotherAnneOther). 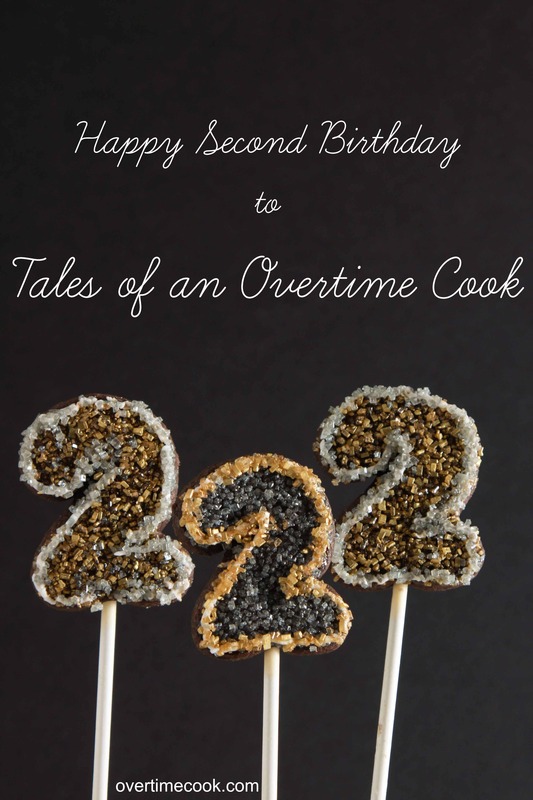 I like Tales of an Overtime Cook on Facebook (Anne Other). I’m also a follower of Overtime Cook on Pinterest (Anne Other). Last but not least, and as I mentioned in my first comment, I’m an email subscriber to your blog, too, using the email address I’m commenting with. Sorry, but I don’t have a smartphone so I can’t do Instagram. Which is too bad, because I love your photographs. i love your blog and have tried several recipes (everything except baked goods, so that’s kind of a waste.) my favorite by far is the caesar dressing and pastrami chicken. while i know that’s a guest post, the pictures are what drew me and also shows you know whom to host. A friend told me to check out your website bec. we went to the same high school. I have tried and liked many of your recipes, but my favorites would probably have to be the creamy basil dip and jalapeno dip! I make them every week for Shabbos and even had to bring them along when we went on vacation last week! hey just saw that Pinterest is it’s own entry! I love your blog- your ideas are always so creative and beautiful looking- and Im always looking for recipes for special occasions. I especially love your decorating guides and tutorials. I started following your blog when you told me about it! and I love it…. and you! These cookies are adorable! 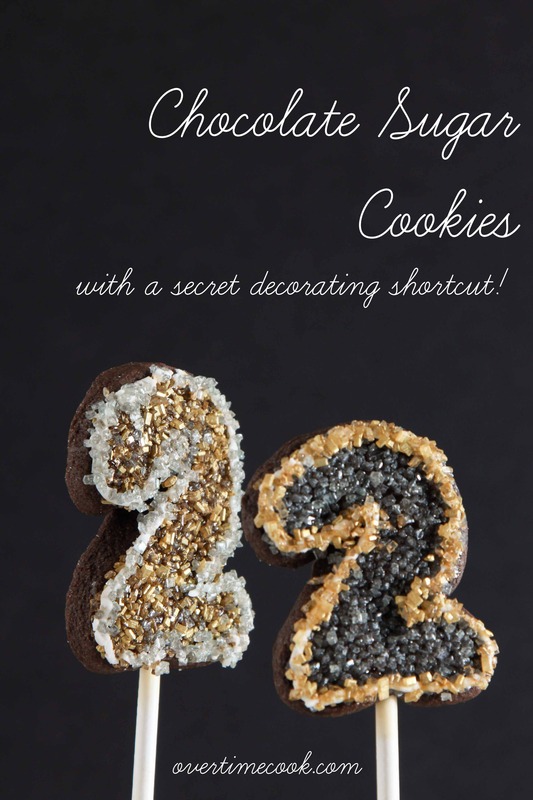 What a great way to make edible decorations for a cake or cupcake!! I follow you on fb, instagram and pinterest 🙂 I found your blog through the ami… love your column!! I don’t remember when I found your blog, but I’m sure glad I did. I love your recipes, and your photographs are amazing! I even saved your web page as an app on my screen. Congrats to another year of blogging success! Wishing you many more. I have been following your blog since the very beginning. The recipes are fantastic, the posts are entertaining, and the photos are beautiful!! I’m a new follower of your blog. I found you through another blog-friend’s site. Congrats on your blogiversary! I think I found your site by doing a google search for kosher recipes… it was so long ago, I can’t remember for sure. Love the decorated cookies! I LOVE getting your emails, trying your recipes, and seeing your gorgeous pix!!! Keep them coming! Very Happy Blogiversarry! My favorite is the red velvet cookies! I follow you on Pinterest (and love your sense of humor there!) and subscribe to emails. I love your healthy recipes….every time I tried one of them it always became a family favorite. I heard about your blog from a friend, and have been following ever since ! Probably for a year and a half! I love trying some of your recipes, and getting new, creative ideas ! I get the emails already ! Good luck on your blog and all your culinary endeavors. Can’t wait to read more. I follow u on Instagram and get ur emails! And I’ve been subscribed to your emails! I honestly don’t even remember how I found your blog but I love your recipes – the zucchini sticks being my favorite! Found out thru my sis in law!